Are the roof tiles on your building looking a little tired? On the surface, the main issue with faded tiles is that they detract from the appearance of your building. However, fading can also indicate that the tiles have degraded to the point where water absorption and leaks can become an expensive problem. What’s more, faded tiles can also affect your roof’s ability to reflect the sun’s powerful rays, resulting in a hotter building and higher energy bills. At Outdoor Cleaning Specialists, our commercial roof painting service will have your roof tiles looking brand new again. We only use Nutech paints – one of the best roof paint products available. As well as being environmentally friendly, Nutech offers you a huge range of colours to choose from and comes with a 10-year product warranty. So if you’d like to enhance the appearance of your building, extend the life of your tiles and potentially reduce your energy costs, our commercial roof painting service is for you! 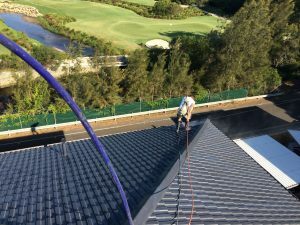 Need commercial roof painting in Sydney?